Happiness Book: Inspirational picture quotes about being happy! Gabi Rupp, creator of LeanJumpStart.com shares an extraordinary collection of her favorite and most inspirational happiness quotes from around the world and throughout history. At times gently surprising and others greatly moving, this collection will not disappoint. Inspirational Picture Quotes about Happiness is a beautiful combination of photography and timeless wisdom. As one of a series of Picture Quotes books it is written for the lover of visually appealing motivational quotes. Whether for your personal library or as a gift, Inspirational Picture Quotes about Happiness is an excellent way to bring a little joy to all! These uniquely curated quotes include a special section where you can explore your own inspiration through self-reliance exercises. It will help you to find happiness within yourself where you can discover a better version of you. It is an easy read detailing the collective life wisdom of the author and her personal journey toward Happiness. Vibrant Pictures Brilliant color photos grace each page, encouraging the reader further towards their happiness goal. This Happiness book is perfect to carry in your pocket for daily affirmations and uplifting messages, sure to make each day a little brighter. A gift book for many occasions...family, friends and co-workers A great one-size-fits-all book that is sure to engage, enlighten, and bring happiness to everyone. With their eclectic mixture of human understanding, wisdom, and sometimes just plain fun, these are gifts that people want to give and love to receive. The paperback version comes with space for your own dedication, good wishes or greetings to your gift book, so that you can create an even more personal and thoughtfully sensitive gift. Greeting cards are read once then thrown away, but a book of happiness quotes can inspire for a lifetime. 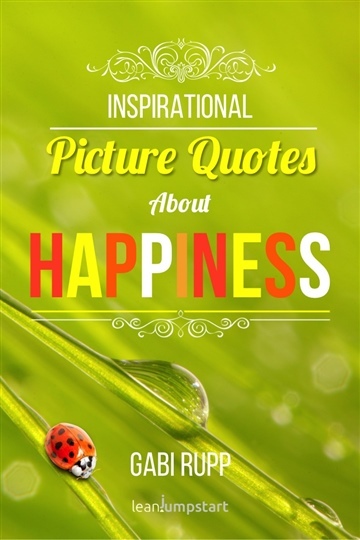 Pick up your copy of Inspirational Picture Quotes about Happiness today and fill your world with Happiness! Bestselling author Gabi Rupp is a dynamic professional whose greatest desire is helping others achieve healthier lifestyles. In 2013 she founded http://leanjumpstart.com and created the 52 Week Clean Eating Challenge where she uses science and realistic methods to encourage others to get in shape and maintain their new healthy habits. In addition to running her business, she has published 52 Chef Habits and a series of Inspirational Picture Quote books....and she's giving away presents! Go to =&gt; http://leanjumpstart.com/friendship5 (just copy and paste link in browser) and get one of her Inspirational Picture Quote Books for FREE!